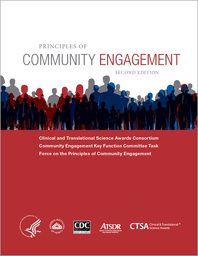 The CTSA Community Engagement Key Function Committee, Duke University, NIH, CDC, and NCRR announce the release of Principles of Community Engagement (Second Edition). This primer provides both the theoretical framework and valuable guidance for engaging partners in clinical and translational research. ACTSI's Community Engagement & Research Program (CERP) director, Dr. Tabia Henry-Akintobi and Dr. Daniel Blumenthal; Morehouse School of Medicine Prevention Research Center faculty and staff; and Community Coalition Board members served as authors, co-authors, and contributors.